From the moment you walk in the lobby of Birchwood Lodge you will find yourself in the world of romance and elegance All amenities included. Birchwood Lodge is within walking distance to shopping, dining, entertainment and public beach in Sister Bay. Birchwood Lodge stands out for its excellence in service, cleanliness and going green practices. Being built in 2001 and remodeled in 2011 says it all. Come and stay with us.... for a lifetime. Certified Travel Green. 2019 Rates: $175-$356 peak season; $85-$216 off season. Our guests are welcome to join us at free Yoga classes at the Birchwood Lodge during the 2011 season. Inquire about the dates. Premier Suite is our standard suite is an expanded studio unit with a unique design - the perfect arrangement for two people, or a family with small children. A king size bed is cleverly situated near the Jacuzzi brand double whirlpool tub, with a full view of the gas fireplace and flat screen TV/DVD above. The queen size sleeper sofa provides casual seating and extra sleeping space for up to two additional people. A kitchenette, small dining area, full bath and private deck or balcony complete the space. All Premier Suites have WiFi. Grand One Bedroom Suite is our signature suite. This spacious suite opens to a full kitchen, dining area and siting area with a flat screen TV/DVD player, queen size sleeper sofa, and access to a private deck / balcony. The dual facing gas fireplace in the sitting area can also be viewed from the private bedroom’s king size bed or Jacuzzi brand double whirlpool tub. There is another door to the deck / balcony from the bedroom. For added luxury, a bidet and a huge walk-in shower with multiple shower heads awaits in the bathroom. Grand Suite has WiFi and sleeps up to four guests. When you step into Premier Deluxe Suite, you’ll immediately be impressed by the space. For those guests who want to stretch out and relax, this suite offers a large private bedroom with a king size bed, Jacuzzi brand double whirlpool tub, gas fireplace with TV/DVD above, full attached bath, and balcony. The open concept main room invites guests to the sitting area with a queen size sleeper sofa for two more guests. 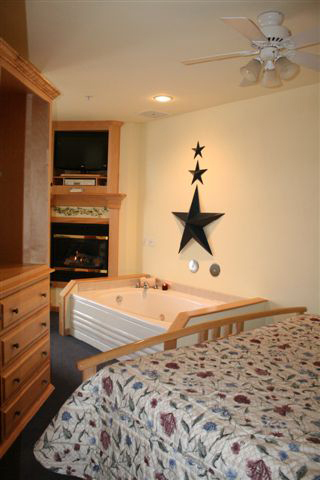 There is another full bath, gas fireplace with TV/DVD above and balcony, too. A fully equipped kitchen allows for meals or snacks preparation near the dining area. Grand Two Bedroom Suite is ideal for family and friends. When you open the door you’ll be impressed by the full size kitchen, dining area for up to six people, and the spacious and comfortable sitting area with flat screen TV/DVD above the gas fireplace. There are the two private bedrooms with full bathrooms on opposite sides of the suite. Each bedroom has a king size bed. the queen size sleeper sofa in the sitting area can be opened to sleep two more people for a total of six guests. Step out on the private deck which spans the entire unit. There is only one two bedroom suite, so plan ahead to reserve this special unit. 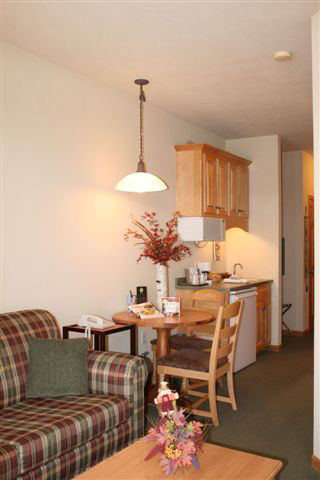 It will feel like home from the moment you enter one of our spacious two bedroom Village Homes. Each one has a fully equipped kitchen, combination living room and dining area, two bedrooms, two full bathrooms and in-unit laundry facilities. The gas fireplace in the living room is situated near a queen size sleeper sofa for two more guests. It is the gathering spot for watching the TV/DVD, or, for conversation or games. Your private deck/balcony will be ideal for relaxation or evening star gazing. Village home sleeps up to 6 people. All Village Homes have WiFi. The newly remodeled, historic Koessl Farm House, which can sleep up to ten people, is the perfect option for large groups of family and friends. Yesterday’s charm has been preserved in this home, updated with modern amenities, such as two 42" Plasmas, flat screen TVs/DVD,WiFi, two person Jacuzzi brand whirlpool tub and an electric fireplace. There is a fully equipped kitchen with dining area, a nice size living room area, and your own private deck with a gas grill. Lean back, relax and take in the distant water view. 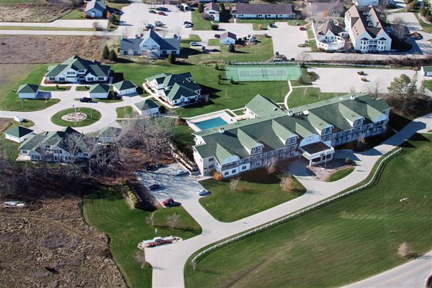 The amenities on the property include a heated outdoor pool, heated indoor pool, heated indoor whirlpool, 12-person spa/sauna, fitness center, game room, outdoor gas grills, tennis court, locker rooms, business center with high speed internet access, guest library, board games, public laundry washer/dryer, free WiFI throughout a whole complex and more! We serve light continental breakfast every morning at no extra charge. In-Unit amenities: Gas Fireplace, Two person Jacuzzi brand whirlpools, Hair Dryers, Double Vanity, Kitchenettes & Kitchen Facilities, Microwave, Toaster, Coffee Maker, Dishes and Silverware, No Pets / Non-Smoking, Telephone, Refrigerator, LCD TVs, Video Cassette Players, DVD/CD/MP3 Players, Queen size pull out sofa sleepers. Birchwood Lodge has two spacious conference rooms that are ideal for a variety of events. Weddings, parties, anniversaries, business meetings, or any other activity that requires a gathering space can be held in Birchwood Lodge’s conference rooms. The friendly Birchwood Lodge staff with special attention to detail will work closely with you to provide the best accommodations. As a way to thank you for the referrals you have sent to Birchwood Lodge we’d like to offer you an incentive that will allow you to get a significant discount off your next stay. The special is called Referral Rewards and can be obtained when you stay at Birchwood Lodge. Referral cards can be obtained at the Front Desk. The next time you stay at Birchwood Lodge simply stop at the Front Desk and ask for referral card. Give these cards to friends, neighbors, and relatives that you would like to refer to us. Let them know that your name on the card entitles them 10% OFF their first time visit to the Birchwood Lodge. Every time a new client presents us with a referral card with your name on it, we will credit you with 10% OFF your next visit. One card is good per one stay. For those looking for adventure and fun activities to take part in, Birchwood Lodge offers different event packages for a great price!